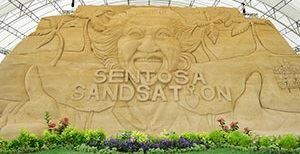 Come with us to witness Southeast Asia's biggest sand festival, Sandsational Fun at Sentosa! Be marveled at larger than life sand sculptures - works of JOOheng who has been showcased over 70 cities across more than 20 countries! The exhibition is spread over 2,400 sqm on Siloso Beach and join us to walk through three distinct zones showcasing different experiences. The 3.5km walk starts from VivoCIty, the route will take you to Sentosa Broadwalk and into Sentosa. Passing by Resort World Sentosa, the route will continue onto Imbiah Trail and finally to Siloso Beach for the Sandsationa Festival! Minimum 10 pax required for the walk to commence.